From the exhibition "In Search of Community"
The photography exhibition "In Search of Community" was held at the San Francisco Photo Center, from February 28 to March 31, 2004. Also see photographs by Angelica Cabande, Tiffany Eng, Pauline Liang, Rebecca Peng, Al Sugano, Pei Wu. Click on images to see large versions. For the last three years, Dr. Rose and her dance students, from SFSU School of Music and Dance, have come to the Valley to teach dancing at the Village and other Visitacion valley sites. After two semesters of practice, these dancers join other city-wide artistic youth to perform in "the Children's Dance Concert," at San Francisco State McKenna, in late fall. 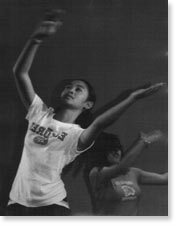 The first year, because the inexperienced dancers only moved one part of their body at a time, all photographs, taken in the dark with no flash, were in focus. 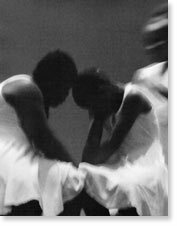 However, by the third year, the dancers' bodies moved in simultaneous rhythm, so all photographs were out of focus. 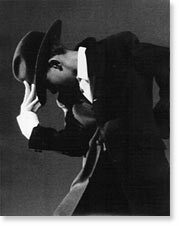 But lack of focus is a small sacrifice to presently experience their serious, joyful and powerful dancing. Unfortunately, this year between the end of rehearsals and performance, the Valley experienced many consecutive days of shooting and the death of an innocent friend. Because of the widespread affect of these events, the three performing rappers rewrote the rap, now "Frisco's Finest," to reflect on the insanity of violence and to question and condemn " ... the hateration ... taking over our nation ... ."
This exhibit is a respectful prayer, ritual, homage, and dance against violence and, most of all, a tribute to these courageous performers and insightful youth as peacemakers. I only hope the concept of peace still exists. What has happened, ain't that pretty? It's 24 right now, how long til fifty? Cuz pullin the trigger ain't "keepin it real"
Why the violence? Why the guns? When you grow up, what do you want to do? Why didn't God make the bullets fail their test? This gotta stop, know what I'm sayin?